Weather has warmed up and these kiddos are all having ample diaper time. Wade also got some underwear time! 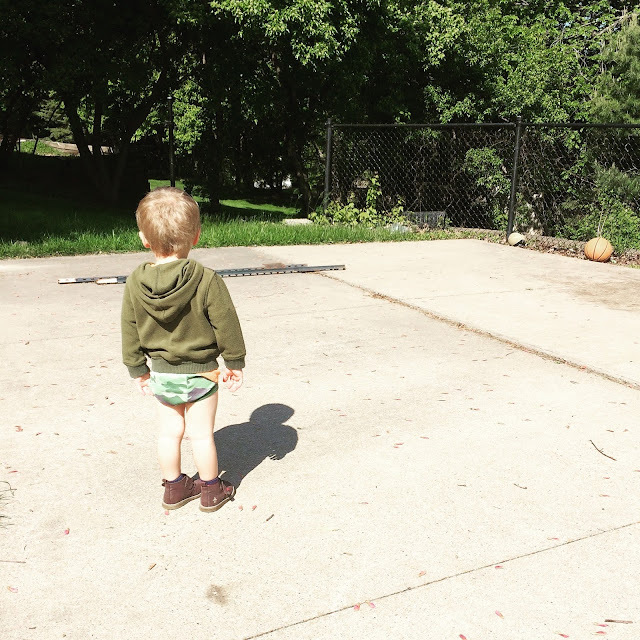 We tried potty training for two days, in which time he never went in the toilet and didn't poop at all. I gave up. We've been watching potty youtube videos, reading books and talking about it for weeks, but he has no interest. Pretty sure I'm doing it wrong. A two year old runs this house. My friend has been teaching me photography and, turns out, I've been doing it wrong. Shutter speed. Ridiculously important. It is so fun and rewarding to learn more, and to spend time with my friend. So excited to see where this skill takes me! Which lead to baths. Wade had to join in the sink baths and found a plate of pasta and ate it while he bathed. Best lunch he ate all week. 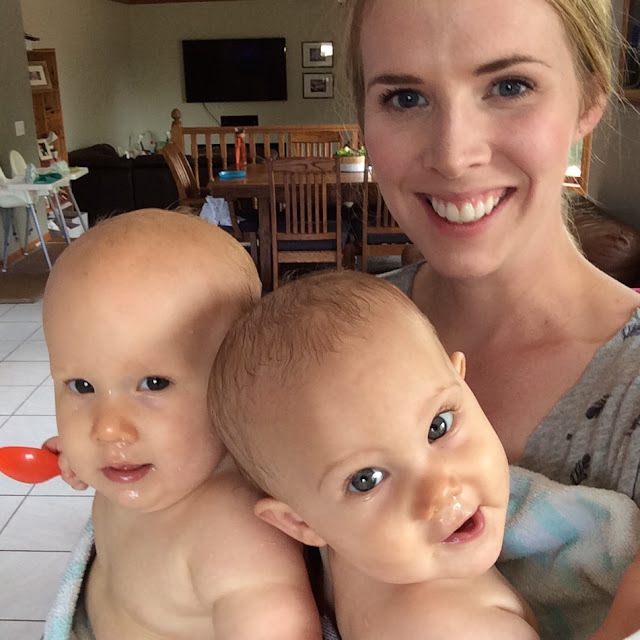 And I'm getting pretty good at this twin mom thing - got both girls out and wrapped in a towel at the same time. Aw yeah! Speaking of winning at motherhood (guys, I gotta shout my wins, cause most of the time I don't leave my house. I left my house 5 times in the last week...including church and the grocery store). 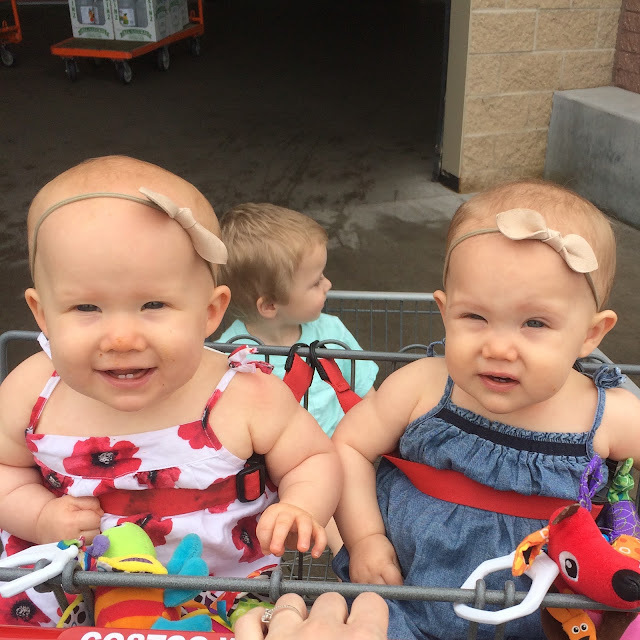 We all went to Costco and the girls rode in the cart for the first time!! They loved it and I actually had room to put groceries. But, oh man, we go so many comments! And they were all happy and flirty and making it the longest trip ever. Yes, Jacqueline has graham cracker on her nose. Always. That was my cue to go. Jacqueline is getting up on her knees! I keep trying to get a picture, but can't! Makes me laugh that my baby book has my first year spanning three pages and here I am sad that I can't capture the micro-milestone of Jac rocking on her knees. Blake is crawling everywhere and pulling herself up onto her knees. I find her like this every time I go pick her up - with the biggest, most proud-of-her-self smile you can imagine! Our basement is (almost) clear! We have big plans and dreams. Okay, not really. We've just barely begun the conversation - enough for Husband to suggest a few places that he could set up a fish tank (eye roll). But we're so excited to have the space available to us for the first time. My mind is reeling with projects we want to do - so why not just add some basement projects onto the queue.